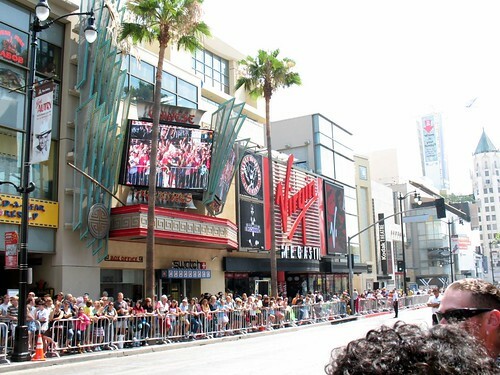 Yesterday’s premiere was a bust, and I was so sleepy after taking Erik to the airport this morning that I chose to go back to sleep instead of waiting in line on Hollywood Blvd. By the time I got there, around 9:30, the line to be allowed to sit or stand and watch the stars went all the way around the block. A sympathetic security guard let some of us sneak in without waiting for the handstamp. We were waiting partway down the block at one of the barricades, and he looked around and then pulled the barrier aside and said, “Quick, quick! Smile and look like you belong.” We dashed through and joined the crowds on the street. 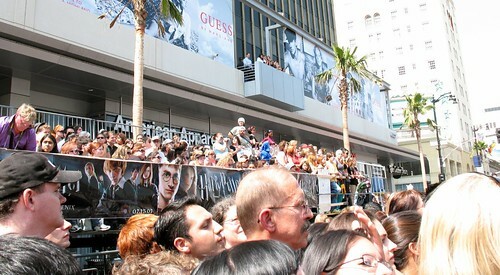 This is where I was, right among these people in the foreground. There were still a couple of layers of people in front of me. After a long wait and many false alarms, Daniel Radcliffe, Emma Watson, and Rupert Grint appeared and made short speeches. They sounded genuinely nervous and excited. 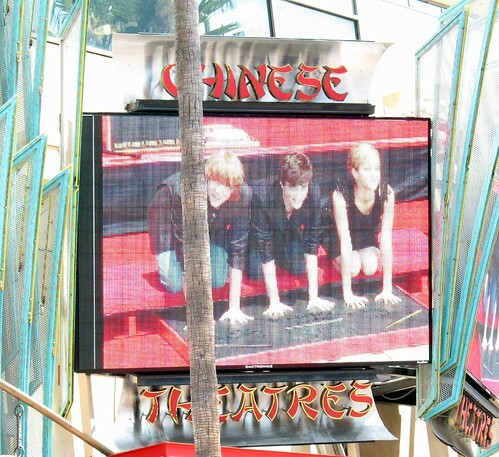 On the big screens above the Chinese Theater box office, we watched the trio place their wands into the cement, followed by their signatures, handprints, and footprints. The emcee had told us several times that the stars were generously donating their shoes (that they were using to step into the cement) to a museum; after they’d stepped in the cement, he reminded us of it again, and through his mike you could hear Daniel Radcliffe exclaim, “Oh, are we? That’s brilliant! I hadn’t heard.” Heh. Lucky it wasn’t a huge charitable donation or he might have got into trouble for that one! After the ceremony the stars looked like they were leaving and everyone was quite disappointed. But then they came out one by one and came up and down the street signing autographs. Emma Watson looked very serious and harried as she made her way along the crowds of people. Daniel actually talked to some people in front of me while he signed, and it struck me how familiar his voice is after five movies. Odd how a voice can be famous too; I’d never thought of it as distinctive, but I realized when I heard him speak that I would probably recognize it even if I hadn’t seen who he was. 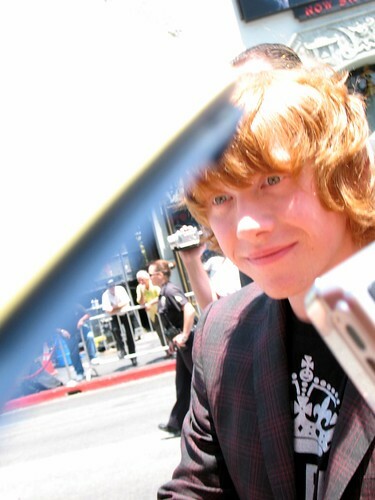 Rupert got the most enthusiastic reception, I think. He’s really very handsome, despite the sometimes schlumpy photos there are out there of him. He also looked the most at ease of the three. To see the rest of the photos I took, go here.